My friend and film maker Alexandros Papathanasiou made a short documentary about Pavilion Parade. On my CDs I have had the privilege of working with some outstanding musicians. The Hills of Arran was co-produced by Rhys Wilson, who also plays piano and guitar. The other musicians on the album are Tara Westover (vocals), Dawn Loombe (accordion), Brian Harvey (bass), Miguel Moreno (flamenco guitar, pictured) and Myke Clifford (wooden flutes). On my earlier CDs I also worked with Stu Hanna (of Megson), Cliff Ward (violin, of The Willows), Lester Lloyd Reason (of The Lights), Jim Gosney (of the Ouse Brothers), Tom Gaskell, Steve MacLachlan, Amanda Hall, Kite Studio, Christine Ledoux, Sandra O’Neil, Lizzie J Taylor and Dave Streatfield. Friends who are also songwriters and collaborators include: Lisa Fitzgibbon, Mark Gamon, Bernard Hoskin, Rick Sanders and Richard Wildman. 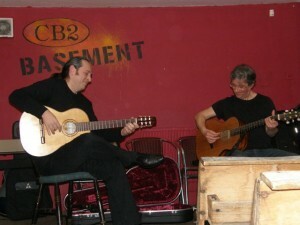 Three of the best local (Cambridge, UK) venues are: Cambridge Acoustic Nights, Acoustic Routes and Cambridge Folk Club.